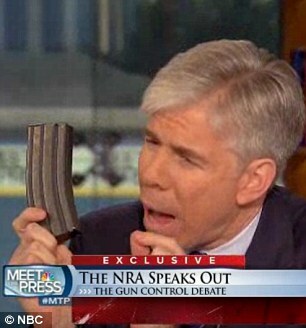 I’ve never watched Meet the Press, so I obviously didn’t see David Gregory’s pathetic attempt to play gotcha by unveiling a magazine while interviewing someone from the National Rifle Association. And even when it was revealed that Gregory had broken D.C. law by possessing this supposedly dangerous object (basically a metal box with a spring), I didn’t care. After all, gun control is a foolish policy (as even some leftists and foreigners are slowly beginning to realize). And surely cops have better things to do, after all, than arrest a callow journalist for something that shouldn’t be against the law in the first place. But I’m now beginning to change my mind. One of the core principles of a just society is that the law applies equally to all people. Heck, that principle is even etched above the entrance to the Supreme Court. If misguided laws were never enforced, I wouldn’t want to target Gregory for discriminatory treatment. But I get very irritated when ordinary folks with no power or connections are persecuted while those with political connections get a free pass. And that’s exactly what’s happening. Here’s an excerpt from a Washington Times report about a member of the non-elite who ran afoul of the same stupid law that Gregory broke. Metropolitan Police Chief Cathy L. Lanier’s spokesman refused Monday to respond to whether Mr. Gregory had even been interviewed yet. This is a rather curious departure for a city that has been ruthless in enforcing this particular firearms statute against law-abiding citizens who made an honest mistake. In July, The Washington Times highlighted the plight of former Army Spc. Adam Meckler, who was arrested and jailed for having a few long-forgotten rounds of ordinary ammunition — but no gun — in his backpack in Washington. Mr. Meckler, a veteran of the wars in Afghanistan and Iraq, says he had no idea it was illegal to possess unregistered ammunition in the city. He violated the same section of D.C. law as Mr. Gregory allegedly did, and both offenses carry the same maximum penalty of a $1,000 fine and a year in jail. Mr. Meckler was charged with the crime and was forced to accept a plea deal to avoid the cost and time of a protracted legal fight. After reading this outrageous story, my first reaction is to want the law repealed. My second reaction is to hope for a judicious and appropriate application of tar and feathers to certain D.C. officials. But I’m also thinking that the high and mighty – including influential journalists – should be subject to the same bad laws as the rest of us. Mark Steyn also has some reprehensible examples of government run amok. He starts with some sage comments on our over-legislated society. …in today’s America there are laws against everything, and any one of us at any time is unknowingly in breach of dozens of them. And in this case NBC were informed by the D.C. police that it would be illegal to show the thing on TV, and they went ahead and did it anyway… David Gregory intended to demonstrate what he regards as the absurdity of America’s lax gun laws. Instead, he’s demonstrating the ever greater absurdity of America’s non-lax laws. And then he lists examples of innocent people caught in the chainsaw of government harassment and persecution. Not far away from David Gregory, across the Virginia border, eleven-year-old Skylar Capo made the mistake of rescuing a woodpecker from the jaws of a cat and nursing him back to health for a couple of days. For her pains, a federal Fish & Wildlife gauleiter accompanied by state troopers descended on her house, charged her with illegal transportation of a protected species, issued her a $535 fine, and made her cry. Daniel Brown was detained at LAX while connecting to a Minneapolis flight because traces of gunpowder were found on his footwear. His footwear was combat boots. As the name suggests, the combat boots were returning from combat — eight months of it, in Iraq’s bloody and violent al-Anbar province. Above the boots he was wearing the uniform of a staff sergeant in the USMC Reserve Military Police and was accompanied by all 26 members of his unit, also in uniform. Staff Sergeant Brown doesn’t sound like an “obvious” terrorist. But the TSA put him on the no-fly list anyway. If it’s not “obvious” to the government that a serving member of the military has any legitimate reason for being around ammunition, why should it be “obvious” that a TV host has? Three days after scofflaw Gregory committed his crime, a bail hearing was held in Massachusetts for Andrew Despres, 20, who’s charged with trespassing and possession of ammunition without a firearms license. Mr. Despres was recently expelled from Fitchburg State University and was returning to campus to pick up his stuff. Hence the trespassing charge. At the time of his arrest, he was wearing a “military-style ammunition belt.” Hence, the firearms charge. …He had no gun. This next story is amusing, until you think about how the coercive power of government is making life difficult for normal people. Ernest Hemingway had a six-toed cat. …descendants of his six-toed cat still live at the Hemingway home in Key West. Tourists visit the property. Thus, the Department of Agriculture is insisting that the six-toed cats are an “animal exhibit” like the tigers at the zoo, and therefore come under federal regulation requiring each to be housed in an individual compound with “elevated resting surfaces,” “electric wire,” and a night watchman. So what’s going to happen with this David Gregory kerfuffle? Well, what should happen is that bad laws should be repealed. In the corrupt world of Washington, though, we know that Gregory hasn’t been arrested even though he clearly broke the law and there’s obvious evidence of his “criminal” behavior. My guess is that the matter will get quietly dropped, and Steyn also assumes something like this will happen. Gregory can call in a favor from some Obama consigliere who’ll lean on the cops to disappear the whole thing. If he does that, he’ll be contributing to the remorseless assault on a bedrock principle of free societies — equality before the law. Laws either apply to all of us or none of us. If they apply only to some, they’re not laws but caprices — and all tyranny is capricious. The moral of the story (though “immoral” is a better word) is simple. Laws are for the little people — and little people need lots of little laws, ensnaring them at every turn. That’s a good description of our corrupt tax code. That’s a good description of America’s regulatory morass. That’s a good description of much of what government now does. If you want to be further depressed, peruse these horror stories of government in action. Our number one fiscal problem is an excessive burden of government spending. A big part of the solution is entitlement reform. Our number two fiscal problem is a punitive and corrupt tax code (as captured by images here, here, and here). A big part of the solution is a simple and fair flat tax. So what do you think happened when the clowns in Washington were forced to address these issues because of the fiscal cliff? To nobody’s surprise, they were missing-in-action on the first problem and they made the second problem worse. Obama got a class-warfare tax hike and nothing was done to control government spending. This was a defeat, but it’s not the end of the world. Indeed, it could be the trigger for a renewed campaign for fiscal responsibility. Here’s some of what I wrote for the Daily Caller, beginning with my assessment that Obama had all the advantages going into the fight over the fiscal cliff. President Obama entered the battle in a very strong position. A big tax increase automatically was going to happen even if he did nothing, so he was holding all the cards. He could — and did — tell Republicans that they had an unpleasant choice of either accepting that big automatic tax increase or acquiescing to his class-warfare plan. No wonder Republicans have been acting so discombobulated. They had no winning strategy. And because of this unpalatable situation, I wrote that “I’m not overly upset with Republicans.” There was no way of denying Obama some sort of tax hike. But they do deserve some blame, at least if they were in office last decade. I am upset with many of them, however, because they were in office during the Bush years and they voted for much of the wasteful spending that helped create the current fiscal mess. Many GOPers beat their chests about being against tax hikes, but that’s not a very credible or sustainable position when they’re also voting for the no-bureaucrat-left-behind education bill, the corrupt farm bills, the pork-filled transportation bills, the prescription drug entitlement, the TARP bailout, and the 2008 faux stimulus. As I explained last month, we would be in much stronger fiscal shape if lawmakers had merely restrained spending over the past 10-plus years so that it “only” grew to keep pace with inflation and population growth. But we can’t undo the past. The real issue is whether we can make progress in the future. Are there strategies that might restrain Leviathan? In the article, I point out that Republicans “have several opportunities in the next few months to show whether they’re on the side of taxpayers.” The key is to pick battles that are winnable. Here are three fights that they can win for the simple reason that nothing can happen without approval of the House of Representatives. This is not a trivial issue. Check out these reports from Townhall and the Weekly Standard to see how politicians have larded the legislation with handouts that have nothing to do with hurricane-related damage. Fiscally responsible lawmakers can make appropriate economic arguments against this pork, but they also can grab the moral high ground and denounce the way special interests and their Capitol Hill lackeys are trying to exploit a tragedy. But even though I’m a huge fan of Switzerland’s spending cap, it’s important to recognize that the debt limit is a two-edged sword. Geithner, Bernanke, and other defenders of the status quo doubtlessly will engage in a lot of reckless demagoguery, falsely asserting that fiscal conservatives could provoke a default if they don’t give Obama a blank check. In the article, I argue that “…lawmakers should insist on genuine spending cuts. And if Obama balks, let him be the one to shut down useless and counterproductive bureaucracies such as the Department of Education and the Department of Housing and Urban Development.” The potential risk of this strategy is that voters will blame fiscal conservatives if there’s a government shutdown, but I explained in an article for National Review that this was a very successful strategy in the mid-1990s. The only problem with these three ideas is that they can only succeed if Republicans genuinely want to fight for smaller government. And as we saw from votes on housing handouts, pork-barrel spending, and corporate welfare, the GOP oftentimes is part of the problem.